I've found some generic stuff from e.g. Black Dog but nothing specific to the Abrams. None of the items in the below Legend set you linked to are Abrams-specific. They are all just general bags, cots, MRE boxes, sleeping bags, coolers, ammo boxes and ammo cans, water jugs, etc. 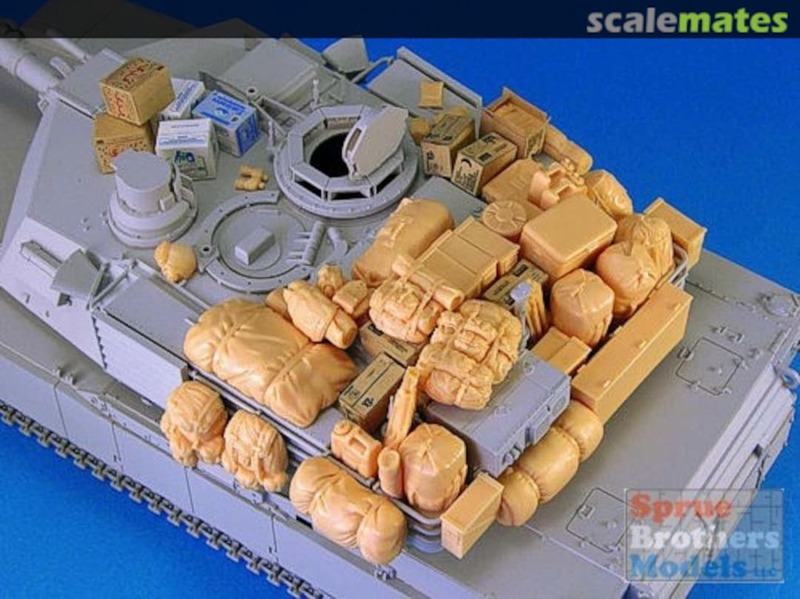 It is all just general Army gear that has been piled onto an Abrams. If you can find similar gear from Black Dog or other sets, just place it on your Abrams and you will be fine. The bigger issue is not to overlaod it. There are four crewmen on an Abrams, so only use four rucksacks, four duffle bags, etc. The below set is really too much for one tank. There is a small set from Red Zebra Models from the UK for 9 pounds specifically for the Tamiya M1A2, which I think is a nice, simple casual kit that looks well when completed. There's a bustle rack insert and spare road wheels for the grunt rails. Glad to help. There is another, more involved set I came across when I was searching for one myself, but I forgot who made it. It had some more than the Red Zebra, but not nearly as much as the Legend stuff Gino posted. I don't think it was black dog, but I can't recall. Interesting. Ill try to keep an eye out. Gaso.Line from the site Quarter Kit. Several modern US accessory sets #1-4. That's the other one I recalled.